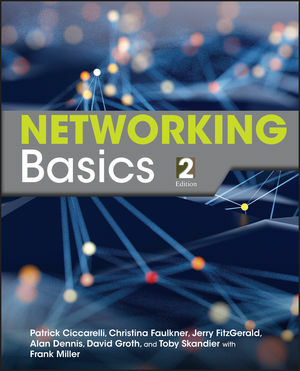 Patrick Ciccarelli and Christina Faulkner are the authors of Introduction to Networking Basics, 2nd Edition, published by Wiley. Apply: What Would You Do? Chapter 3 includes new In the Real World feature on 802.16 Wireless MANTM. Content on legacy technology IPX/SPX was removed. Chapter 4 introduces cloud networking and virtual hosting. There is also a new section on choosing network architecture with list of advantages and disadvantages. Chapter 5 has been revised to include less information on ring topology and more information on wireless network topologies. Chapter 7 now includes a further explanation of IPv6 concept and enhancements, with parameters. Chapter 8 has been updated with Windows Server 2008 and 2008R2 information. New sections on understanding group policy, virtualization and section on NetWare Novell has been cut down. Chapter 11 was revised to include a section on VPN security. Career Connection and In the Real World sections presents real life examples throughout the text, which illustrates how professional architects, interior designers, and other design gurus use Google SketchUp. Clear, everyday languageand clean format. Students can read each chapter without being intimidated by difficult language or overwhelmed by sidebars, textboxes, and other fillers that interrupt the flow of the writing. TIPs from the Professionals. A list of tips that provide relevant advice and helpful tools for students. Apply: What Would You Do?These questions drive home key ideas by asking students to synthesize andapply chapter concepts to new, real-life situations and scenarios. Be a Networker...Found at the end of each chapter, ?Be a . . .? questions are designed to extend students? thinking and are thus ideal for discussion or writing assignments. Using an open-ended format and sometimes based on Web sources, they encourage students to draw conclusions using chapter material applied to real-world situations, which fosters both mastery and independent learning. Pre-test. This pre-reading assessment tool in multiple-choice format introduces chapter material and the learning outcomes. By focusing students? attention on what they do not know, the self-test provides a benchmark against which they can measure their own progress. Post-test. After students have completed the chapter they have the ability to take a post test. It includes all of the questions in the pre-test, so that students can see how their learning has progressed and improved.